Molten steel was discovered in the basements of the collapsed WTC. Fire couldn't raise the temperature high enough to melt steel, but explosives, particularly thermite, could. So we have three sources? Maybe not. Let's go back to a more complete telling of the story. Tully called Mark Loizeaux, president of Controlled Demolition, Inc. (CDI) of Phoenix, Maryland, for consultation about removing the debris. CDI calls itself "the innovator and global leader in the controlled demolition and implosion of structures." Loizeaux, who cleaned up the bombed Federal Building in Oklahoma City, arrived on the WTC site two days later and wrote the clean-up plan for the entire operation. AFP asked Loizeaux about the report of molten steel on the site. "Yes," he said, "hot spots of molten steel in the basements." These incredibly hot areas were found "at the bottoms of the elevator shafts of the main towers, down seven [basement] levels," Loizeaux said. The molten steel was found "three, four, and five weeks later, when the rubble was being removed," Loizeaux said. He said molten steel was also found at 7 WTC, which collapsed mysteriously in the late afternoon. Construction steel has an extremely high melting point of about 2,800° Fahrenheit (1535° Celsius). Asked what could have caused such extreme heat, Tully said, "Think of the jet fuel." I didn't personally see molten steel at the World Trade Center site. It was reported to me by contractors we had been working with. Molten steel was encountered primarily during excavation of debris around the South Tower when large hydraulic excavators were digging trenches 2 to 4 meters deep into the compacted/burning debris pile. There are both video tape and still photos of the molten steel being "dipped" out by the buckets of excavators. I'm not sure where you can get a copy. If accurate, the source has now moved from Loizeaux back to contractors, but there’s no information here on how the substance was identified as “molten steel”, or who might have performed the analysis to figure it out. There’s another complication in terms of the WTC debris temperatures, according to NASA analyses made on September 16th and 23rd. Initial analysis of these data revealed a number of thermal hot spots on September 16 in the region where the buildings collapsed 5 days earlier. Analysis of the data indicates temperatures greater than 800 degrees F. Over 3 dozen hot spots appear in the core zone. By September 23, only 4, or possibly 5, hot spots are apparent, with temperatures cooler than those on September 16. Over 800 degrees F is hot, but not nearly hot enough. A more speculative view on the paper suggests maximum temperatures of 1341 degrees F ( http://pubs.usgs.gov/of/2001/ofr-01-0429/thermal.r09.html ), but that's still well below the “about 2,800° Fahrenheit” we need to get "literally molten steel". The get-out here is that NASA could only see surface temperatures, obviously. And they took their first measurements on the 16th, so temperatures could have been even higher before then. Keep in mind that the hotspots had reduced significantly by the 23rd, though, and excavators wouldn’t have been digging anywhere close to the basement levels until some time after that. Other accounts suggest the temperatures needn’t have been that high to produce noticeable and dramatic effects. However, Clark doesn't know how deep into the pile AVIRIS could see. The infrared data certainly revealed surface temperatures, yet the smoldering piles below the surface may have remained at much higher temperatures. "In mid-October, in the evening," said Thomas A. Cahill, a retired professor of physics and atmospheric science at the University of California, Davis, "when they would pull out a steel beam, the lower part would be glowing dull red, which indicates a temperature on the order of 500 to 600 °C. And we know that people were turning over pieces of concrete in December that would flash into fire--which requires about 300 °C. So the surface of the pile cooled rather rapidly, but the bulk of the pile stayed hot all the way to December." Perhaps aware of these problems, some people use other accounts to support the "molten steel" idea. Let's look at a few of those. Dr. Allison Geyh was one of a team of public health investigators from Johns Hopkins who visited the WTC site after 9-11. She reported in the Late Fall 2001 issue of Magazine of Johns Hopkins Public Health, "In some pockets now being uncovered they are finding molten steel. Eaton's quote refers to "molten metal", not steel. The use of “glowing red” suggests he may not mean it’s liquid metal, either. Williams notes of the presentation only talk of “molten metal”, not steel. It’s possible to construct a case that Robertson mentioned “molten steel” in the lecture, but forgot it later, and Williams wrote “molten steel” rather than metal because, ah, he just did. But short of some evidence to support that, this quote doesn’t appear to have much substance. The Sarah Atlas story also appears to be use “molten steel” for dramatic effect, rather than anything else. How could she possibly know for sure that “molten steel flowed in the pile of ruins still settling beneath her feet"? We checked with the author, and he said this information would have been a quote from someone, but he doesn’t remember who (and none of the possible subjects would really qualify as an expert witness). My name is Frank Silecchia. I am one of the many WTC Ground Zero workers who was devastated by what I saw and encountered after the Twin Towers collasped. The fire temperature reaches temperatures of 1,700°C deep beneath the ground. Coal fires produce higher temperatures than we’d expect from the debris pile, but then Steve Jones suggests we only need 845°C to 1,040°C to explain our glowing steel. Could that be produced with the materials available, and oxygen filtering in from above, or from the subways connected to the WTC basement level? The standard fires do not always represent the most severe fire conditions. Structural members having been designed to standard fires may fail to survive in real fires. For example, the modern offices tend to contain large quantities of hydrocarbon fuels in decoration, furniture, computers and electric devices, in forms of polymers, plastics, artificial leathers and laminates etc. Consequently, the fire becomes more severe than the conventional standard fire. Office fires can be severe, then. What temperatures are achievable? The same page details four different fire types, and shows their temperature range over time. Figure 1 shows the various nominal fire curves for comparison. It can be seen that, over a period of 2 hours, the hydrocarbon fire is the most severe followed by the standard fire, with the external fire being the least severe fire although the slow heating fire represents the lowest temperature up to 30 minutes. It is noteworthy that for standard and smouldering fires, the temperature continuously increases with increasing time. For the external fire, the temperature remains constant at 680°C after approximate 22 minutes. Whereas for the hydrocarbon fires, the temperatures remain constant at 1100°C and 1120°C after approximate 40 minutes. Note that the hydrocarbon fire passed 1000 degrees Centrigrade (1832°F) very quickly, and even the smouldering fire reached this point over time. The well ventilated compartments experienced lower temperatures and fires of shorter duration. Less ventilation means more severe fires? This obviously only works up to a point -- reduce the oxygen supply too much and the fire will die down -- but it does illustrate that the relationship between ventilation and temperature isn’t a simple one. As can be seen in the above table, peak measured temperatures exceeded 1300°C in five tests, this measurement being supported by the observation of total heat fluxes of up to 350 kW/m2 and velocities of over 15m/s. These values are somewhat higher than those observed in typical full-scale compartment fire tests and can be attributed in part to the highly insulating walls, the inclusion of plastic in the fuel and the short residence times (due to high flow rates). Again, ordinary fuels with a little plastic, and the right conditions, yielded high temperatures. And this applied even to the steel itself, where the maximum temperature record in four tests proved to be 1220, 1301, 1245 and 1196 °C (that’s a peak of 2372 °F). The apparently melted ends of each of the four springs were cut off and mounted in a metallurgical mounting medium, polished, etched, and examined at up to 500x. Three of the four springs exhibited a decarburized ferrite microstructure, with oxidation on the top surface. Such a microstructure is typical of steel exposed to temperatures in the range of 1800°F [982 °C]. One of the wire ends exhibited a ferrite microstructure with oxidation on the top surface and incipient melting at the grain boundaries. This particular wire end had attained temperatures of between 2100°F [1148 °C] and 2200°F [1204 °C]. This wire end had, in fact, just begun to melt, which is what we would expect if there was melting further down the wire. It doesn’t require special materials for a fire to approach 1000°C, then. And in this final case, one steel spring sample could have attained temperatures as high as 1204 °C. Whether the conditions in the debris pile would allow it is another matter, but beware people who dismiss this out of hand: no-one knows for sure. None of this proves anything, of course, but it is interesting. Especially because, if this is an accurate photo of what someone was describing as “molten steel” then it’s clearly different from the entirely “liquid steel” that some people imagine. There’s some support for this use of “molten” elsewhere. 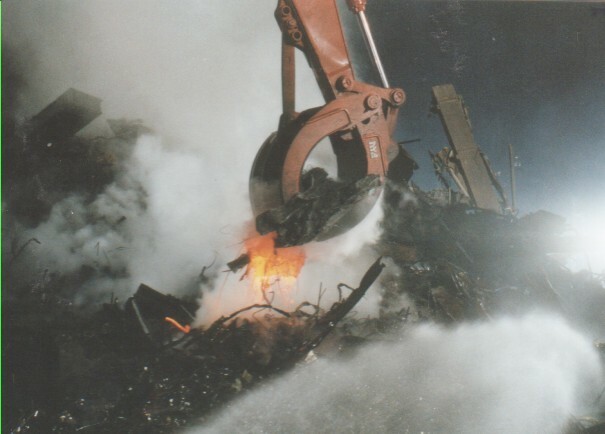 NYDS played a major role in debris removal — everything from molten steel beams to human remains — running trucks back and forth between Ground Zero and Fresh Kills landfill, which was reopened to accommodate the debris. A “molten” steel beam? If it’s a steel beam, then it’s not “molten” in the sense of being liquid metal. Does he just mean steel that appeared deformed, or was glowing when first removed from the debris pile? Underground fires raged for months. O'Toole remembers in February seeing a crane lift a steel beam vertically from deep within the catacombs of Ground Zero. "It was dripping from the molten steel," he said. “Molten steel” in February, perhaps 5 months after the attacks? If it’s proposed that something like thermite/ thermate was responsible, then we can’t help wonder how much would be required to maintain high temperatures for so long. The advocates of controlled demolition don’t appear to have made any calculations in this area. And it’s not difficult to imagine why. Of course they could simply say that this particular report was mistaken, and the beam was “dripping” from something else. But on what basis do we dismiss this report and accept the others? I personally saw open fires, glowing and twisted I-beams. I was told, but do not remember by whom, that the workers were finding molten steel. Of course you could argue that there are too many stories to be “explained away”, that there’s no way fire alone could account for all these reports. But if so, what about these? RICH GARLOCK: Going below, it was smoky and really hot. We had rescue teams with meters for oxygen and carbon dioxide. They also had temperature monitors. Here WTC 6 is over my head. The debris past the columns was red-hot, molten, running. Only “molten metal” and debris, but if that phrase is good enough in Keith Eaton’s testimony, why not here? Does this show that thermite was planted in Building 6, too? Or could it be that the fire was enough, after all?